I guess I have a soft-spot for weird, short-lived magazines. I’ve talked about how much I love RAW here before, and now I’ve just read Leonard Koren’s book Making WET: The Magazine of Gourmet Bathing about, well, making WET: The Magazine of Gourmet Bathing. That was probably pretty obvious. 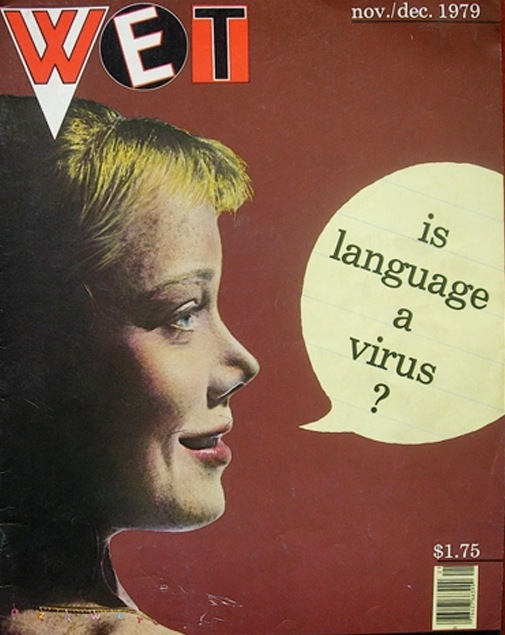 Unlike RAW, though, I’ve never seen a copy of WET — but I was hipped to it when MetaFilter ran an incredibly interesting piece on it. Once I read the articles linked, I knew I had to have this book. contributor, sure, but they also shared an aesthetic, one RAW applied to comics and design that WET applied to photography and prose. The piece in Making WET reprinted from the November/December ‘79 issue “Concerning the Metaphysical Nature of Cigarettes” reminds me of some of the text pieces run in RAW (but without Francoise Mouly’s collage design) — it’s a very high-brow satirical piece about the then-new trend of naming cigarette brands after obscure concepts like “Merit”, “Fact” or “True”, rather than the “iconographic” names like Winston or Salem which “depended on [television advertising] to give full definition to their images”. Sharon Hennessey, the author, then riffs on smoking as a philosophical exercise with personal philosophies like deconstructionism or realism determining which brand was smoked, and rather the idea that holding a certain philosophy compelled one to smoke. If there’s a flaw in Making WET, it’s that there are few of these articles reprinted — only a small handful made it – a piece defining “Gourmet Bathing”, an interview with a WET cover model (a dog), and a long Matt Groening strip reviewing soaps. What does make up for this though is the gorgeous reproductions of covers and interior photographs and art, along side Koren’s essay about the rise and fall of the magazine, from everything including raising financing, to getting ads and promoting WET. I’m not sure if the techniques still would hold 30 years later — but reading Making WET makes me want to try. Part of the great thing about Making WET is how much it does make me (I was going to say “the reader” here, but I think I might just be weird) want to create a magazine themselves from the ground up. Doing layout, doing graphic design, commissioning articles, all that fun stuff. I mean, that’s kinda what Kittysneezes IS — an attempt at an online magazine, but, well, that’s different in feel. Design is more locked in — and, well, there’s just something about having a PHYSICAL magazine to look at. Online, it’s more about pure content — sure, there’s something to be said for design online, but it’s more difficult to drastically change the design from article to article. Once you dial in the design for the site, it tends to make all the content look the same. And, of course, it’s very important to have a GOOD design — and trust me, I’ve seen some terribly designed websites in my day (and made a few, too), but… web design is very different than print design, and a bit more rigid. Of course, print media becomes a dodgier and dodgier proposition by the minute, which makes me sad — and makes me wonder. I’ve often wondered what the RAW or WET of today is…. but I also wonder if there even IS one… or COULD be. Has that ship sailed? I hope not. Anyway, that’s a bit of a digression for a book review — but if you take away anything, it should be that you really should read Making WET. And maybe start your own magazine. Or help me start my own magazine. Something like that, anyway. Give Dad a ‘Close Shave’ for Father’s Day at Advertiser Serenza Spa & Salon! Outdoor lights got wet — now what?